Saaj Baghdad is located near SW 10th and Washington in downtown Portland, Oregon. Layth is the owner of this food cart. As usual, I'm searching around for food carts and placing heavy priority on the places with more unique offerings. I had never heard of Iraqi bread before, and based on the pictures on the cart, it takes on a triangular shape. The bread is split open like a pocket pita to place the meat, veggies, and condiments inside. Yup, Halal food served here. 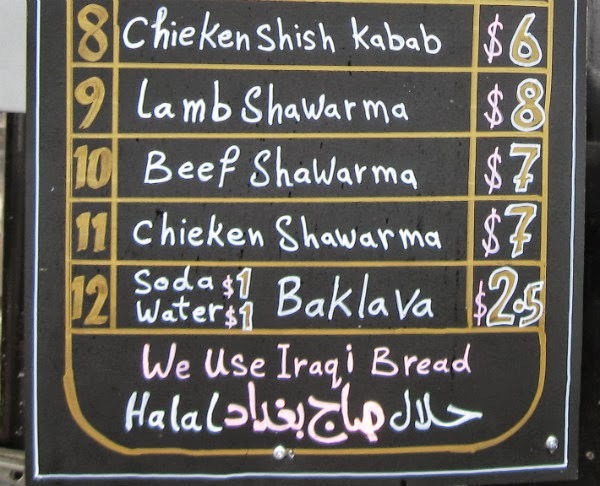 I got the lamb shawarma ($8) and got a decent-sized sandwich in return. I thought the strips of lamb were cooked well and seasoned nicely. I think the tzatziki, which nestled against the bread and veggies, could have gone better when drizzled on the lamb. I liked the colorful vegetables (lettuce, carrots, and purple cabbage) which looked like something I'd use for cole slaw. Parts of the bread, namely the side with the tzatziki and veggies, had a crunchy exterior, while further down on the sandwich (on the warm lamb side), I got more of a pleasing, softened texture. The sandwiches range from $5 to $8. Plates range from $5 to $9. The baklava is $2.50 and has some good size to it. I'm assuming their burritos also use a version of their Iraqi bread. I never imagined I would see Tapatio at an Iraqi food cart.